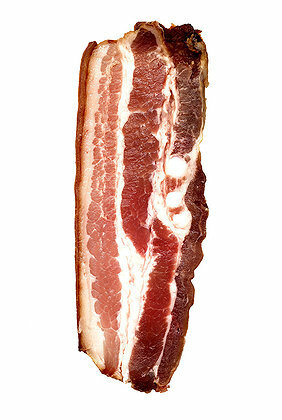 You know the saying, “Everything’s better with bacon?” Denny’s is celebrating this concept with “Baconalia”, a “Baconian Feast” featuring 7 new ways to enjoy the meat. The most inventive, (read: disgusting) offering is the Maple Bacon Sundae. Yep, it’s exactly what you thought it was: vanilla ice cream, topped with maple syrup and a generous sprinkling of bacon bits! Just to show you that we aren’t the food snobs you think we are, (okay, so maybe we are) we are giving you the link to a coupon offering you a 2 for 1 deal on this culinary delight! Hurry, this offer is only available until April 9. Pepto Bismal not included. Gay? There’s an App for That! 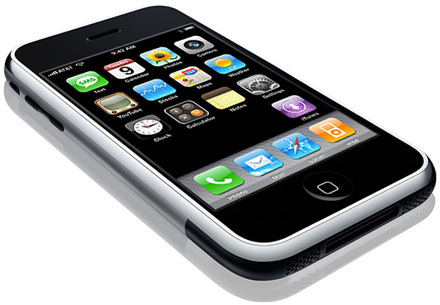 Apple has recently withdrawn the “anti-gay” iPhone application, created by religious group, Exodus. A Facebook campaign accrued over 146,000 signatures, in an effort to get Apple to remove the app from the iTunes store. As of today, the app is no longer available, and a donation to fight California’s gay marriage ban has been made by the company. Isn’t it ironic, that in an age of high technology and futuristic thinking, that an app was created to promote an antiquated and bigoted point of view? It just goes to show you, that there truly is an app for just about anything these days. Here is an easy dish that is full of flavor, and has a slightly different twist for those of you who love the Asian Salmon recipe that I posted last year. Finely chop 2 garlic cloves, a small chunk of fresh peeled ginger, and a large handful of cilantro. Add the juice of one lime, about ½ cup of low sodium soy sauce, about 2 tablespoons of sesame oil and a little olive oil. Mix it all together in a bowl. 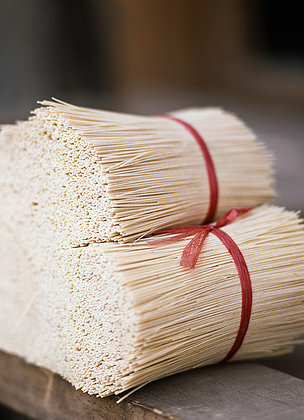 Cook soba noodles according to directions, usually about 3-4 minutes and drain well. Add this to the soy mixture and toss gently. Place soba noodles with sauce in a bowl, and put the salmon filet on top. Sprinkle with sesame seeds and chopped scallions. In a very bold move, French fashion house Christian Dior fired it’s designer John Galliano, just days before the show. The very talented and flamboyant Mr., Galliano was said to have gotten into a fight in a bar, and made anti-Semitic slurs to other patrons. He was detained by the Paris police, suspended from his job at Dior, and subsequently fired, when a video proclaiming his love of Hitler was later released. He was also prohibited from attending the showing of his eponymous John Galliano collection, which Dior’s parent company has controlling interest of. 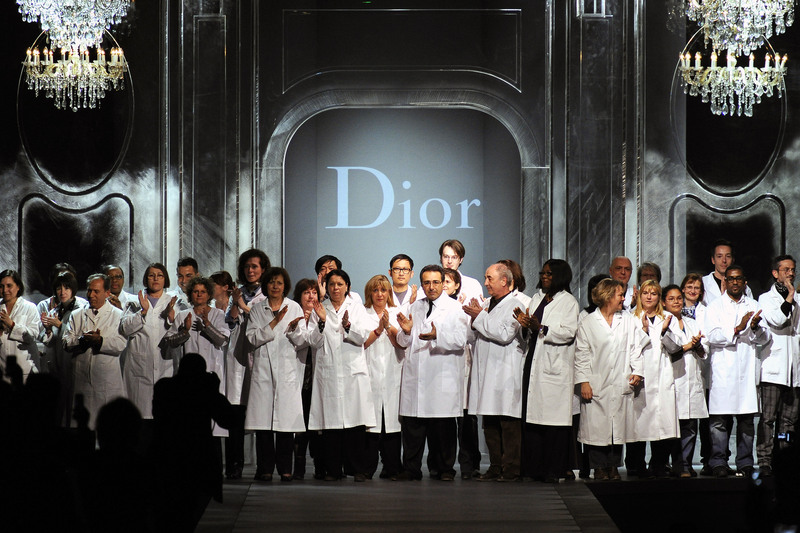 At the end of show, instead of Galliano’s usual dramatic entrance, the entire atelier team came out in their white coats to take the final bow, to thunderous applause. Kudos to you Mr. Toledano, for making one of the most meaningful gestures in the fashion world today. Supermodel Kate Moss made her return to the runway last week for fashion powerhouse, Louis Vuitton. Known in the 90’s as the original “waif”, Moss has definitely filled out a bit. Still slim by anyone’s standards, we were shocked to see the severe dimpling of cellulite on the back of her thighs. Those fatty deposits known as cellulite, are a rite of passage for 90% of women, and are almost impossible to get rid of. A healthy diet, lots of exercise and the avoidance of alcohol, cigarettes, sugar and sodium are helpful. Exfoliating and moisturizing the cellulite ridden area helps to alleviate the dimpled look, as does a spray tan. Creams containing caffeine are also thought to have a temporary effect. The bottom line, (no pun intended) is that there is no known treatment that is guaranteed to eliminate cellulite, but generally speaking, the lower the body fat, and the higher the muscle mass is, the less you will see it. And if all else fails, realize that nobody is perfect, even a supermodel. ﻿﻿﻿﻿The internet is abuzz with the latest McDonalds disaster, the McLobster Roll! Actually, the sandwich was launched several years ago, and is only available in Maine and the Canadian Maritimes, where it is called the McHomard. Rumored to contain “lobster flavored pollack”, mayonaise and celery, and served on a hotdog bun, the sandwich comes with fries and a soft drink. 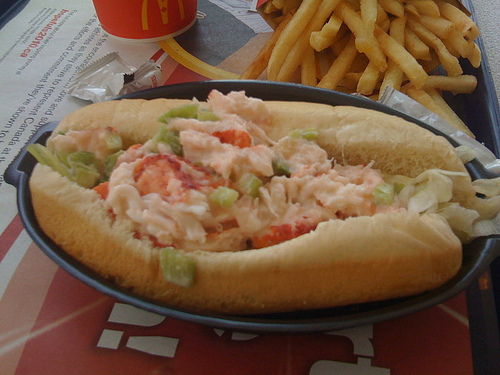 I don’t know about you, but if I am every craving a lobster roll, McDonalds would be the last place I would go! Everyone seems to be an expert these days, and the fashion world seems rife with reality stars and actresses passing themselves off as designers. It’s only natural that crowd sourcing would be the next step in the process. Renowned designer Derek Lam, in collaboration with eBay has done just that. Lam recently showed his debut collection of lower priced dresses for Derek Lam + eBay, during New York Fashion week. The 16 dresses were presented at Lincoln Center in a room with computers where the guests could vote on their favorite designs. The company’s website also offered the public a chance to weigh in. The top 5 styles were selected to be produced and will be sold on eBay’s site starting May 10. 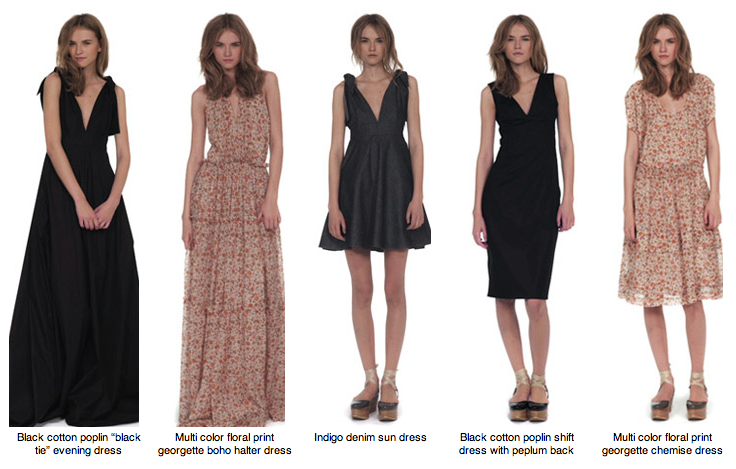 The dresses range from $175-$295 and range in sizes 0-16.